Visualisation is an important tool for insight generation, but it is rare that you get the data in exactly the right form you need. Often you’ll need to create some new variables or summaries, or maybe you just want to rename the variables or reorder the observations in order to make the data a little easier to work with. You’ll learn how to do all that (and more!) in this chapter, which will teach you how to transform your data using the dplyr package and a new dataset on flights departing New York City in 2013. In this chapter we’re going to focus on how to use the dplyr package, another core member of the tidyverse. We’ll illustrate the key ideas using data from the nycflights13 package, and use ggplot2 to help us understand the data. Take careful note of the conflicts message that’s printed when you load the tidyverse. It tells you that dplyr overwrites some functions in base R. If you want to use the base version of these functions after loading dplyr, you’ll need to use their full names: stats::filter() and stats::lag(). To explore the basic data manipulation verbs of dplyr, we’ll use nycflights13::flights. This data frame contains all 336,776 flights that departed from New York City in 2013. The data comes from the US Bureau of Transportation Statistics, and is documented in ?flights. You might notice that this data frame prints a little differently from other data frames you might have used in the past: it only shows the first few rows and all the columns that fit on one screen. (To see the whole dataset, you can run View(flights) which will open the dataset in the RStudio viewer). It prints differently because it’s a tibble. Tibbles are data frames, but slightly tweaked to work better in the tidyverse. For now, you don’t need to worry about the differences; we’ll come back to tibbles in more detail in wrangle. dbl stands for doubles, or real numbers. chr stands for character vectors, or strings. dttm stands for date-times (a date + a time). lgl stands for logical, vectors that contain only TRUE or FALSE. fctr stands for factors, which R uses to represent categorical variables with fixed possible values. Pick observations by their values (filter()). Pick variables by their names (select()). Create new variables with functions of existing variables (mutate()). Collapse many values down to a single summary (summarise()). These can all be used in conjunction with group_by() which changes the scope of each function from operating on the entire dataset to operating on it group-by-group. These six functions provide the verbs for a language of data manipulation. The first argument is a data frame. The subsequent arguments describe what to do with the data frame, using the variable names (without quotes). The result is a new data frame. Together these properties make it easy to chain together multiple simple steps to achieve a complex result. Let’s dive in and see how these verbs work. To use filtering effectively, you have to know how to select the observations that you want using the comparison operators. R provides the standard suite: >, >=, <, <=, != (not equal), and == (equal). #> Error: `month` (`month = 1`) must not be named, do you need `==`? There’s another common problem you might encounter when using ==: floating point numbers. These results might surprise you! Multiple arguments to filter() are combined with “and”: every expression must be true in order for a row to be included in the output. For other types of combinations, you’ll need to use Boolean operators yourself: & is “and”, | is “or”, and ! is “not”. Figure 5.1 shows the complete set of Boolean operations. Figure 5.1: Complete set of boolean operations. x is the left-hand circle, y is the right-hand circle, and the shaded region show which parts each operator selects. The order of operations doesn’t work like English. You can’t write filter(flights, month == 11 | 12), which you might literally translate into “finds all flights that departed in November or December”. Instead it finds all months that equal 11 | 12, an expression that evaluates to TRUE. In a numeric context (like here), TRUE becomes one, so this finds all flights in January, not November or December. This is quite confusing! As well as & and |, R also has && and ||. Don’t use them here! You’ll learn when you should use them in conditional execution. Whenever you start using complicated, multipart expressions in filter(), consider making them explicit variables instead. That makes it much easier to check your work. You’ll learn how to create new variables shortly. One important feature of R that can make comparison tricky are missing values, or NAs (“not availables”). NA represents an unknown value so missing values are “contagious”: almost any operation involving an unknown value will also be unknown. # Let x be Mary's age. We don't know how old she is. # Let y be John's age. We don't know how old he is. # Are John and Mary the same age? Another useful dplyr filtering helper is between(). What does it do? Can you use it to simplify the code needed to answer the previous challenges? How many flights have a missing dep_time? What other variables are missing? What might these rows represent? How could you use arrange() to sort all missing values to the start? (Hint: use is.na()). Sort flights to find the most delayed flights. Find the flights that left earliest. Sort flights to find the fastest flights. Which flights travelled the longest? Which travelled the shortest? It’s not uncommon to get datasets with hundreds or even thousands of variables. In this case, the first challenge is often narrowing in on the variables you’re actually interested in. select() allows you to rapidly zoom in on a useful subset using operations based on the names of the variables. starts_with("abc"): matches names that begin with “abc”. ends_with("xyz"): matches names that end with “xyz”. contains("ijk"): matches names that contain “ijk”. matches("(. )\\1"): selects variables that match a regular expression. This one matches any variables that contain repeated characters. You’ll learn more about regular expressions in strings. num_range("x", 1:3): matches x1, x2 and x3. See ?select for more details. Another option is to use select() in conjunction with the everything() helper. This is useful if you have a handful of variables you’d like to move to the start of the data frame. Brainstorm as many ways as possible to select dep_time, dep_delay, arr_time, and arr_delay from flights. What happens if you include the name of a variable multiple times in a select() call? What does the one_of() function do? Why might it be helpful in conjunction with this vector? Does the result of running the following code surprise you? How do the select helpers deal with case by default? How can you change that default? Besides selecting sets of existing columns, it’s often useful to add new columns that are functions of existing columns. That’s the job of mutate(). mutate() always adds new columns at the end of your dataset so we’ll start by creating a narrower dataset so we can see the new variables. Remember that when you’re in RStudio, the easiest way to see all the columns is View(). #> 1  2013     1     1         2        11     1400      227    -9  370. #> 2  2013     1     1         4        20     1416      227   -16  374. #> 3  2013     1     1         2        33     1089      160   -31  408. #> 4  2013     1     1        -1       -18     1576      183    17  517. #> 5  2013     1     1        -6       -25      762      116    19  394. #> 6  2013     1     1        -4        12      719      150   -16  288. Arithmetic operators: +, -, *, /, ^. These are all vectorised, using the so called “recycling rules”. If one parameter is shorter than the other, it will be automatically extended to be the same length. This is most useful when one of the arguments is a single number: air_time / 60, hours * 60 + minute, etc. Arithmetic operators are also useful in conjunction with the aggregate functions you’ll learn about later. For example, x / sum(x) calculates the proportion of a total, and y - mean(y) computes the difference from the mean. Logs: log(), log2(), log10(). Logarithms are an incredibly useful transformation for dealing with data that ranges across multiple orders of magnitude. They also convert multiplicative relationships to additive, a feature we’ll come back to in modelling. All else being equal, I recommend using log2() because it’s easy to interpret: a difference of 1 on the log scale corresponds to doubling on the original scale and a difference of -1 corresponds to halving. Offsets: lead() and lag() allow you to refer to leading or lagging values. This allows you to compute running differences (e.g. x - lag(x)) or find when values change (x != lag(x)). They are most useful in conjunction with group_by(), which you’ll learn about shortly. Cumulative and rolling aggregates: R provides functions for running sums, products, mins and maxes: cumsum(), cumprod(), cummin(), cummax(); and dplyr provides cummean() for cumulative means. If you need rolling aggregates (i.e. a sum computed over a rolling window), try the RcppRoll package. Logical comparisons, <, <=, >, >=, !=, and ==, which you learned about earlier. If you’re doing a complex sequence of logical operations it’s often a good idea to store the interim values in new variables so you can check that each step is working as expected. Ranking: there are a number of ranking functions, but you should start with min_rank(). It does the most usual type of ranking (e.g. 1st, 2nd, 2nd, 4th). The default gives smallest values the small ranks; use desc(x) to give the largest values the smallest ranks. If min_rank() doesn’t do what you need, look at the variants row_number(), dense_rank(), percent_rank(), cume_dist(), ntile(). See their help pages for more details. Currently dep_time and sched_dep_time are convenient to look at, but hard to compute with because they’re not really continuous numbers. Convert them to a more convenient representation of number of minutes since midnight. Compare air_time with arr_time - dep_time. What do you expect to see? What do you see? What do you need to do to fix it? Compare dep_time, sched_dep_time, and dep_delay. How would you expect those three numbers to be related? Find the 10 most delayed flights using a ranking function. How do you want to handle ties? Carefully read the documentation for min_rank(). What does 1:3 + 1:10 return? Why? What trigonometric functions does R provide? Together group_by() and summarise() provide one of the tools that you’ll use most commonly when working with dplyr: grouped summaries. But before we go any further with this, we need to introduce a powerful new idea: the pipe. # ability to make up delays in the air? Summarise to compute distance, average delay, and number of flights. Filter to remove noisy points and Honolulu airport, which is almost twice as far away as the next closest airport. This code is a little frustrating to write because we have to give each intermediate data frame a name, even though we don’t care about it. Naming things is hard, so this slows down our analysis. This focuses on the transformations, not what’s being transformed, which makes the code easier to read. You can read it as a series of imperative statements: group, then summarise, then filter. As suggested by this reading, a good way to pronounce %>% when reading code is “then”. Behind the scenes, x %>% f(y) turns into f(x, y), and x %>% f(y) %>% g(z) turns into g(f(x, y), z) and so on. You can use the pipe to rewrite multiple operations in a way that you can read left-to-right, top-to-bottom. We’ll use piping frequently from now on because it considerably improves the readability of code, and we’ll come back to it in more detail in pipes. Working with the pipe is one of the key criteria for belonging to the tidyverse. The only exception is ggplot2: it was written before the pipe was discovered. 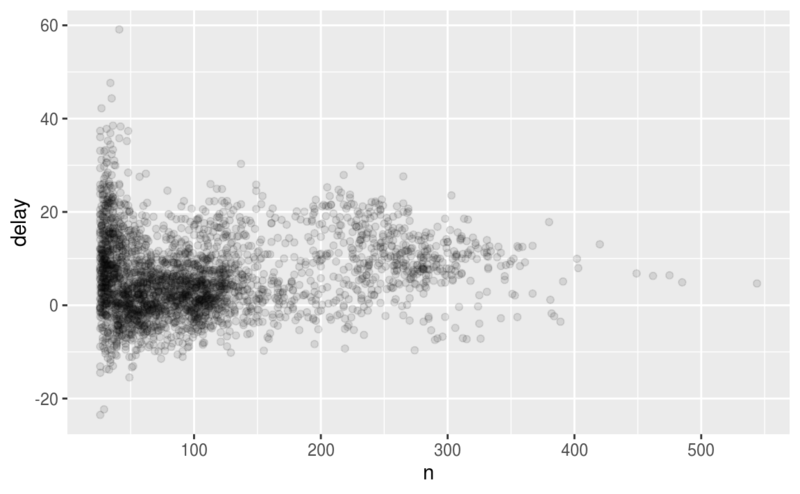 Unfortunately, the next iteration of ggplot2, ggvis, which does use the pipe, isn’t quite ready for prime time yet. You may have wondered about the na.rm argument we used above. What happens if we don’t set it? In this case, where missing values represent cancelled flights, we could also tackle the problem by first removing the cancelled flights. We’ll save this dataset so we can reuse it in the next few examples. Wow, there are some planes that have an average delay of 5 hours (300 minutes)! 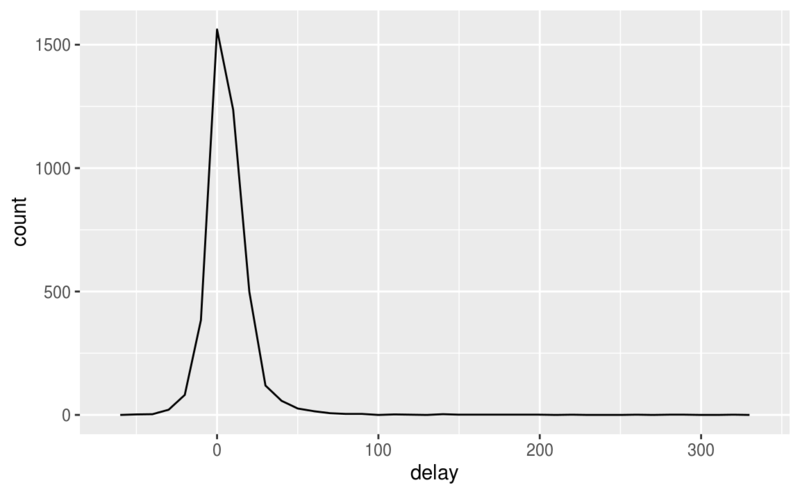 Not surprisingly, there is much greater variation in the average delay when there are few flights. The shape of this plot is very characteristic: whenever you plot a mean (or other summary) vs. group size, you’ll see that the variation decreases as the sample size increases. When looking at this sort of plot, it’s often useful to filter out the groups with the smallest numbers of observations, so you can see more of the pattern and less of the extreme variation in the smallest groups. This is what the following code does, as well as showing you a handy pattern for integrating ggplot2 into dplyr flows. It’s a bit painful that you have to switch from %>% to +, but once you get the hang of it, it’s quite convenient. RStudio tip: a useful keyboard shortcut is Cmd/Ctrl + Shift + P. This resends the previously sent chunk from the editor to the console. This is very convenient when you’re (e.g.) exploring the value of n in the example above. You send the whole block once with Cmd/Ctrl + Enter, then you modify the value of n and press Cmd/Ctrl + Shift + P to resend the complete block. There’s another common variation of this type of pattern. Let’s look at how the average performance of batters in baseball is related to the number of times they’re at bat. Here I use data from the Lahman package to compute the batting average (number of hits / number of attempts) of every major league baseball player. As above, the variation in our aggregate decreases as we get more data points. There’s a positive correlation between skill (ba) and opportunities to hit the ball (ab). This is because teams control who gets to play, and obviously they’ll pick their best players. You can find a good explanation of this problem at http://varianceexplained.org/r/empirical_bayes_baseball/ and http://www.evanmiller.org/how-not-to-sort-by-average-rating.html. 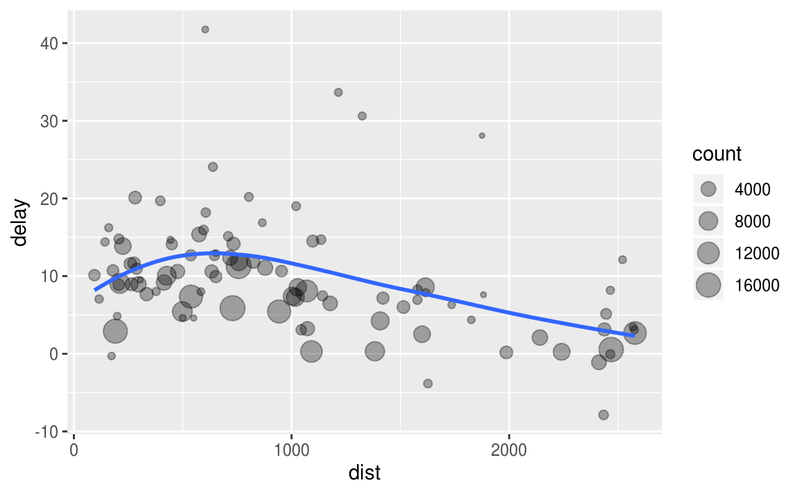 Measures of location: we’ve used mean(x), but median(x) is also useful. The mean is the sum divided by the length; the median is a value where 50% of x is above it, and 50% is below it. It’s sometimes useful to combine aggregation with logical subsetting. We haven’t talked about this sort of subsetting yet, but you’ll learn more about it in subsetting. Measures of spread: sd(x), IQR(x), mad(x). The root mean squared deviation, or standard deviation sd(x), is the standard measure of spread. The interquartile range IQR(x) and median absolute deviation mad(x) are robust equivalents that may be more useful if you have outliers. # Why is distance to some destinations more variable than to others? 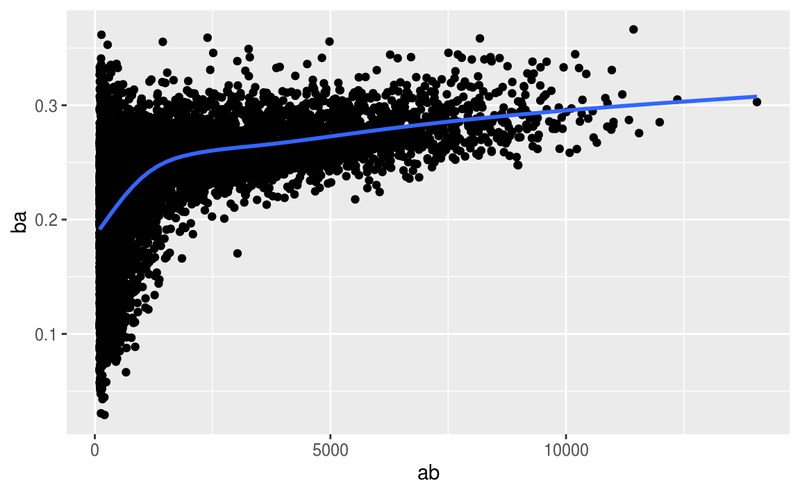 Measures of rank: min(x), quantile(x, 0.25), max(x). Quantiles are a generalisation of the median. For example, quantile(x, 0.25) will find a value of x that is greater than 25% of the values, and less than the remaining 75%. # When do the first and last flights leave each day? 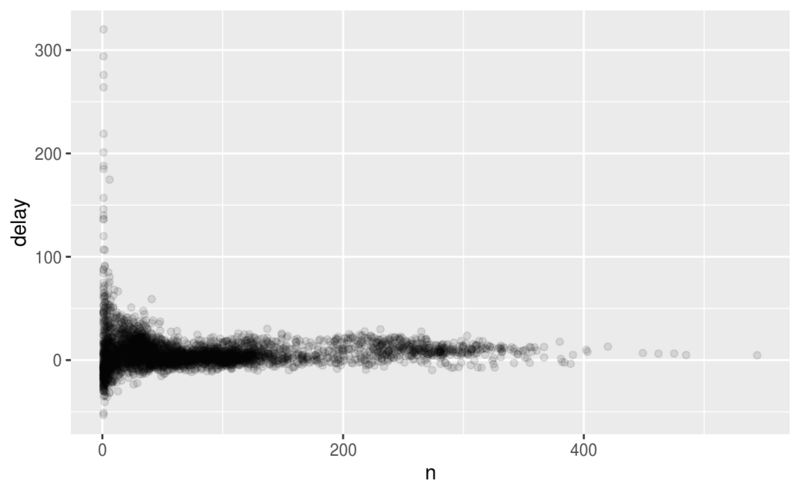 Counts: You’ve seen n(), which takes no arguments, and returns the size of the current group. To count the number of non-missing values, use sum(!is.na(x)). To count the number of distinct (unique) values, use n_distinct(x). # Which destinations have the most carriers? Counts and proportions of logical values: sum(x > 10), mean(y == 0). When used with numeric functions, TRUE is converted to 1 and FALSE to 0. This makes sum() and mean() very useful: sum(x) gives the number of TRUEs in x, and mean(x) gives the proportion. # What proportion of flights are delayed by more than an hour? Be careful when progressively rolling up summaries: it’s OK for sums and counts, but you need to think about weighting means and variances, and it’s not possible to do it exactly for rank-based statistics like the median. In other words, the sum of groupwise sums is the overall sum, but the median of groupwise medians is not the overall median. If you need to remove grouping, and return to operations on ungrouped data, use ungroup(). A flight is 15 minutes early 50% of the time, and 15 minutes late 50% of the time. A flight is always 10 minutes late. A flight is 30 minutes early 50% of the time, and 30 minutes late 50% of the time. 99% of the time a flight is on time. 1% of the time it’s 2 hours late. Which is more important: arrival delay or departure delay? Come up with another approach that will give you the same output as not_cancelled %>% count(dest) and not_cancelled %>% count(tailnum, wt = distance) (without using count()). Our definition of cancelled flights (is.na(dep_delay) | is.na(arr_delay) ) is slightly suboptimal. Why? Which is the most important column? Look at the number of cancelled flights per day. Is there a pattern? Is the proportion of cancelled flights related to the average delay? What does the sort argument to count() do. When might you use it? A grouped filter is a grouped mutate followed by an ungrouped filter. I generally avoid them except for quick and dirty manipulations: otherwise it’s hard to check that you’ve done the manipulation correctly. Functions that work most naturally in grouped mutates and filters are known as window functions (vs. the summary functions used for summaries). You can learn more about useful window functions in the corresponding vignette: vignette("window-functions"). Refer back to the lists of useful mutate and filtering functions. Describe how each operation changes when you combine it with grouping. Which plane (tailnum) has the worst on-time record? What time of day should you fly if you want to avoid delays as much as possible? For each destination, compute the total minutes of delay. For each flight, compute the proportion of the total delay for its destination. Delays are typically temporally correlated: even once the problem that caused the initial delay has been resolved, later flights are delayed to allow earlier flights to leave. Using lag(), explore how the delay of a flight is related to the delay of the immediately preceding flight. Look at each destination. Can you find flights that are suspiciously fast? (i.e. flights that represent a potential data entry error). Compute the air time a flight relative to the shortest flight to that destination. Which flights were most delayed in the air? Find all destinations that are flown by at least two carriers. Use that information to rank the carriers. For each plane, count the number of flights before the first delay of greater than 1 hour.